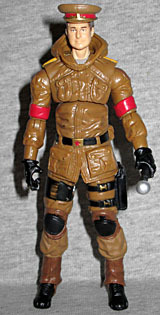 In 1986, the GI Joe team got a new leader who seemed to come out of nowhere. In 1987, the same thing happened to Cobra. So why are fans getting mad now that it's the Oktober Guard's turn? Iron Bear is the Oktober Guard General and their best kept secret. He is an experienced war veteran with detailed knowledge of military strategies, battles, locations, vehicles, armaments, and noteworthy soldiers. He is a very wise and confident leader, yet humble around his soldiers. It is rumored that he has amassed a sizable collection of war memorabilia, but no one knows where it is kept. Although he commands his elite team behind the scenes, there are occasions when he must leave their secret headquarters to protect and serve the interests of Mother Russia. Iron Bear has spent years avoiding attempts on his life from traitorous double agents within the Soviet army. 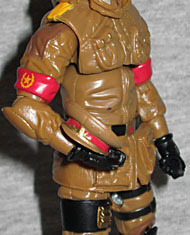 Now he must contend with Destro and his deadly Iron Grenadiers. However, he has learned to stay one step ahead of the enemy and always keep on the move. It may be a never ending task, but he proudly directs his elite special missions team to strike at them until the very last man is standing. Remember back when Sigma 6 started, and Hasbro was doing their "Direct To Consumer" releases of Generation 2 figures? One of the planned offerings was a new commander for the Oktober Guard. 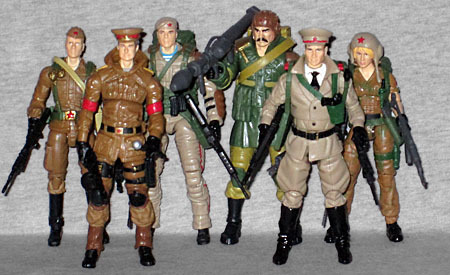 The DTC program ended before he could come out, but the GI Joe Collectors' Club picked up the idea and ran with it. From the neck down, Iron Bear is just Resolute Arctic Duke, which is a great choice: the coat says "winter" and the limbs say "soldier," and together they say "Russian military." Thus, it's a smart re-use. There's a larger-than-usual gap between the upper and lower torso, and the head balljoint really only swivels, but the rest of the construction is fine. Since there is no previous Iron Bear to compare this figure to, there's no rule about what his face should look like. 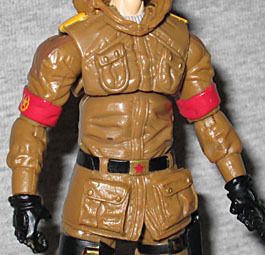 Like many Joes before him, his sculpt is based on a real person: in this case, Derryl DePriest, Hasbro's VP of Global Brand Management (who is apparently a huge fan of GI Joe). The head looks a little small on the body, but the sculpt is good. Rather than the expected "arctic gear" colors of white and gray, Iron Bear's uniform is a ruddy brown. It's the same color worn by Schrage and Daina, and while he doesn't have any of the green that the rest of the team wears, he does have red armbands and yellow epaulettes. His hat is a new piece, not the same one worn by either Colonel Brekhov or Red Star. It has a red hat band, a golden braid, and a fancy badge right in the front. Shame it doesn't actually fit his (tiny, tiny) head very well. In addition to the ill-fitting hat, Iron Bear comes with a baton, a knife, and a rifle with a removable ammo drum. The baton suits a guy who's giving orders, and the weapons are just as cool now as they were with Red Star. Our only complaint? He has no sheath for the knife. Well, that, and his hat keeps falling off. Can you tell we're annoyed by that? General Iron Bear may not be a pre-existing character, but we're okay with that: as we've said before, if all you ever do is updates of old toys, there's no forward growth. He fits into the established story well, and the figure is pretty good. He may not be the star of this set, but he's a perfectly fine addition to the ranks of the Oktober Guard.